No longer just a rumour! All this will be yours in just a few months. Nintendo president Satoru Iwata today announced during his address to The Foreign Correspondents' Club of Japan that Wii Sports Resort would be released in Japan in June, with an overseas release in July. 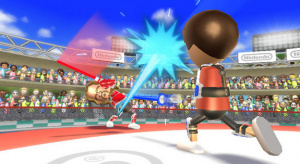 The sequel to Nintendo's hugely successful pack-in title uses the enhanced motion-sensing capabilities of the Motion-Plus peripheral to accurately simulate activities such as sword-fighting, jet-ski racing and Frisbee. The game will come bundled with the accessory and a special extended Wiimote jacket that accomodates the added length of the controller when used in conjunction with the add-on. The Wii MotionPlus will also be available as a stand-alone purchase at release. Iwata's announcement seems to confirm earlier reports which suggested a July 10 release for the bundle, denied as rumour in typical Nintendo fashion. Until those dates are confirmed, we'll just have to continue speculating. 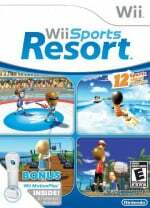 Expect an announcement here at Nintendo Life when Wii Sports Resort is given a confirmed release date. So does the package include game+peripheral+controller+jacket, or just game+peripheral+jacket? Looks like it'll be fun! I just hope there aren't just a small selection of sports or activities, I hope there's more than just jet-skiing, sword-play, and frisbee toss (not that they aren't cool, I just don't want to pay $40 for 4 games). Still no clue what events will be included beyond the ones demo'ed last year though, eh? That's exciting news! I've been interested in the motion+ thing ever since it was unveiled, I can't wait to try it out! Yay - it's just a shame that a big chunk of E3 will likely be taken up with showing off the new mini games. This game is what I would consider myself getting once the game is released. I heard there is going to be between 8 and 10 total sports. Can't wait for this. The motion plus should be bundled with it! I am looking forward to the motion plus as the new Tennis game from EA and also the Tiger Wood game uses it! sweet. I think this is the saber fight that people have been waiting for. As long as these offer head to head I think this will be an instant classic. I'm more interesting in the pricing of it rather than when. Though that said I didn't like the original Wii Sports very much so prehaps I'm better holding off for games with benefit from the peripheral. I'm probably not getting this. The first one was just good enough to be free IMO. But I guess we'll see. Let's think about this: The game will come bundled with ONE MotionPlus add-on. Most people are excited about the multi-player "sword fighting" game which will require TWO MotionPlus add-ons. ...Inventory problem? i cant just know what 3 of the games are on the game i want to know what all 10 are befor we buy it!!! Looks like a perfect birthday present for me as it be released about 3 days before my birthday . MotionPlus FTW thru i most probably throw out the jacket . July 10, that works for me, in between track and cross country season. Looks like I'll be throwing out my arm soon enough. I hope there is more than just 3 events. So far I only know about sword-fighting, jet-ski racing and Frisbee. "Let's think about this: The game will come bundled with ONE MotionPlus add-on. Most people are excited about the multi-player "sword fighting" game which will require TWO MotionPlus add-ons. ...Inventory problem?" If Nintendo is intelligent, they'll do it in the same way as they did with Wii Play: They sell it seperately on the one hand and together with Wii Sports Resort for a (slightly) higher price on the other. By the way, I read about 8 different events in a print magazine. Well, since no one's say it, and everyone's wondering...what's this thing going to cost us?